The measurement of muscle mass/size means “how many pounds of lean muscle mass you have.” The less muscle mass your body has, the slower your resting metabolic rate. The slower your metabolic rate is, the harder it is to take or keep weight off. In fact, one of the biggest reasons why people tend to gain body fat as they get older is not necessarily because they are growing older but rather because their metabolic rate is slowing down. The bodies needs for energy slowly decrease when muscle mass is lost and we cannot eat the same amount of food that we used to without gaining weight. Since your personal metabolic rate determines how quickly (or not) you burn up fuel on any given day, the faster your metabolic rate is, the more calories you’ll burn and the slower it is, the less calories you burn and the more body fat you’ll gain. Each person has their own metabolic rate due to genetics, but muscle mass cannot be overlooked in the role it plays. It is an important factor in determining BMR – your Basal Metabolic Rate. BMR can be understood as the “the amount of energy expended to keep you alive and performing basic functions like breathing, heart beating and body tissue maintenance” even when at rest. 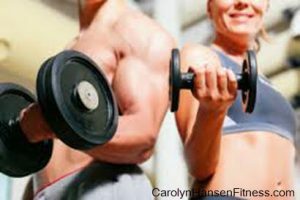 It’s obvious then, that in order to keep body fat in check as we age, we must pay attention to our muscle mass because muscle mass controls our metabolism which eventually shows up in our weight. Although you must always look to and pay attention to your diet and the nutrition you are supplying your body, great nutrition only goes so far. Without a doubt, “strength” is the key player and strength training the key activity when it comes to maintaining your lean muscle mass. No other form of exercise will help to maintain your strength level better than a proper strength training protocol will. Muscle is high maintenance tissue, in constant use. It requires and burns through a lot of energy daily in order to stay in prime working order. Fat stores calories, but lean muscles burn them. Without proper strength training exercise, you can plan on losing about ½ pound or so per year of precious muscle tissue. Even worse, after the age of 50 this rate doubles! Without proper attention and active use, statistics show that by the time we reach 65 years of age, our strength will have dropped by nearly half! Strength training not only grows strong toned muscles but provide the extra benefit of growing strong, dense bones as well. The real truth is, old age has little to do with loss of muscle mass and its accompanying weight gain. Its inactivity and sedentary lifestyles that are to blame. The overriding factor in both metabolic rate and weight gain is muscle mass. This is where your focus needs to be. You may not be able to “stop the clock” entirely, but you can still feel and look younger than your years if you pay attention to your lifestyle habits and only choose those that contribute to lengthening your years rather than robbing them. The rewards for being fit and healthy each and every hour of the day is that you get to enjoy the freedoms of a healthy body that won’t hold you back simply because you are getting older.